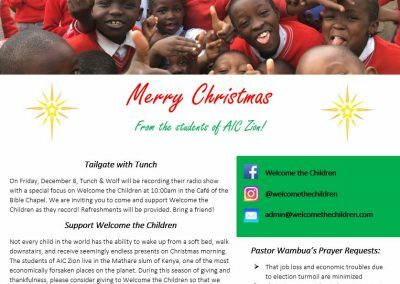 What's New with Welcome the Children? 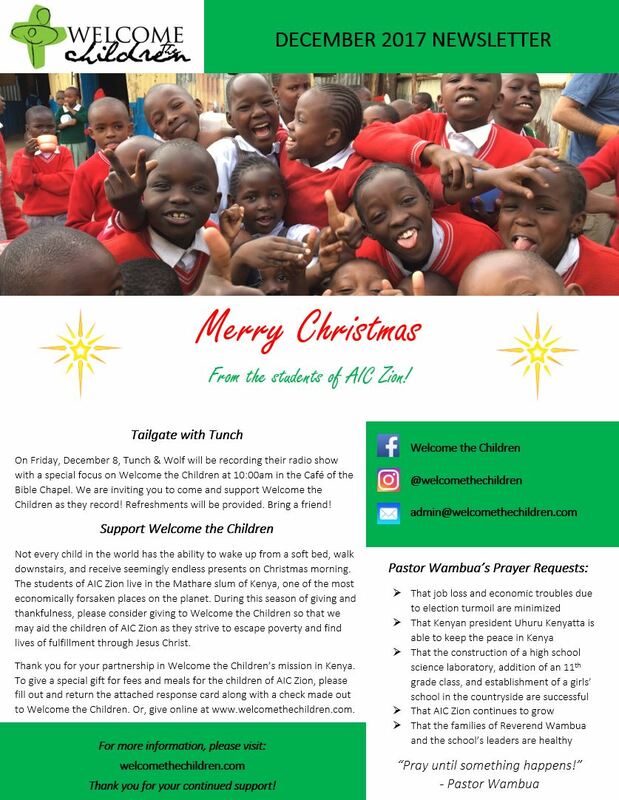 View our quarterly newsletters for prayer requests and featured stories! 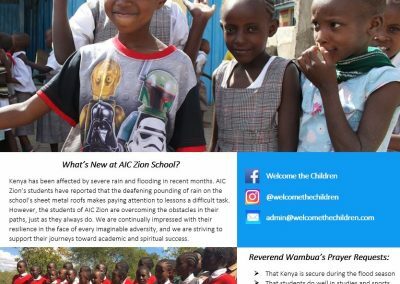 Our “Student Stories” Gala celebrated our relationship with AIC Zion School and encouraged our supporters to help us “give a child a future.” We listened to interviews with three of AIC Zion School’s students, who shared about Christian education’s life-changing influence on them and their families. “In the Locker Room with Tunch & Wolf” featured Welcome the Children as they recorded their radio show at the Bible Chapel. Check out the video below! 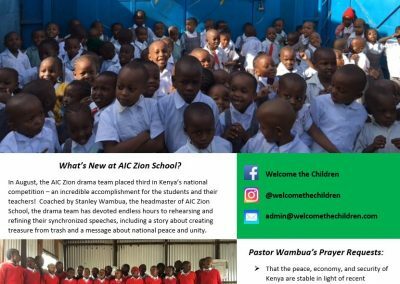 In August, the AIC Zion School drama team placed third in Kenya’s national competition–an incredible accomplishment for the students and their teachers. 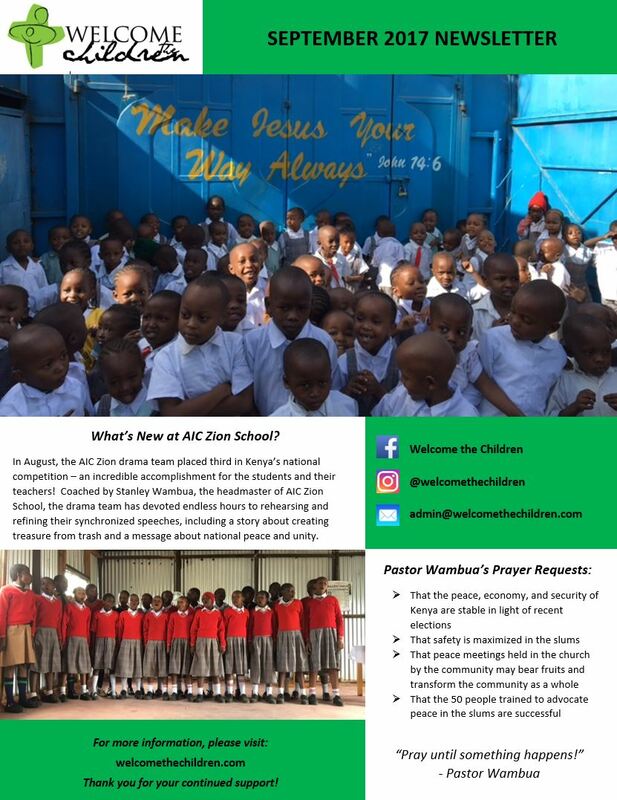 Coached by Stanley Wambua, the headmaster of AIC Zion School, the drama team has devoted endless hours to rehearsing and refining their synchronized speeches, which include a story about creating treasure from trash and a message about national peace and unity. Kindly pray for us to recover from fire damage. As you may have learned from social media, there was fire in the Mathare slum and our school and church were affected in a great way. The fire affected us physically and psychologically, hence we are in need of prayer. The block occupying the youth hall, seven classrooms, the staff room, and the deputy head teacher’s office were burned. This block is on the northern side of the school. We lost desks, tables, textbooks, chairs, etc. in the fire. We are working on estimating the actual loss amount. Pray for God to provide funds for reconstruction and replacement of equipment and furniture. 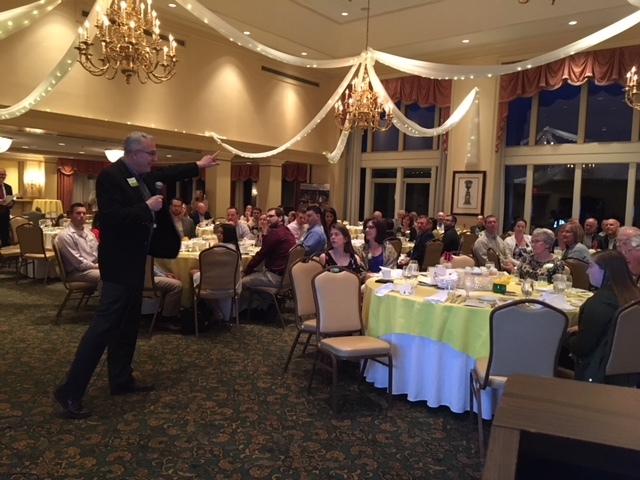 Parents and church members had been calling since they are affected psychologically, so pray for me to have the words to encourage them, as I encourage myself. I was affected emotionally as the school was burned, while I was looking at it helpless because of lack of water, hence the need of a borehole. Pray for this need as to supply us with water daily. It was during the Christmas season and all our elders were out of the city because of the celebrations. The pastors were also on leave so I had to address the whole problem alone. Now most elders have cut their celebrations and pastors have come hence I am now healing emotionally and I thank God for that. This fire started on Tuesday, 26 December 2016, at 6pm Kenya time and spread very fast and within 30 minutes the church youth hall was on fire. It took us, parents, and church members four hours to put off the fire for reason of lack of water. The fact that we do not have fire corridor space between us and the slum caused the fire to get us very easily; pray we get fire corridor around the school as it is with the church. Church leaders will meet tonight to make a plan for the way forward, so pray for them as they discuss about how; reconstruction, replacements and controlling fire in the future. Pray for us and be blessed. Destroyed: Building Block C classrooms, the youth hall, the deputy head teacher’s office, and the primary school staffroom. Loss of all desks, textbooks and other classroom furniture. Damaged: Building Block B classrooms, the women’s hall, and fencing around the compound. 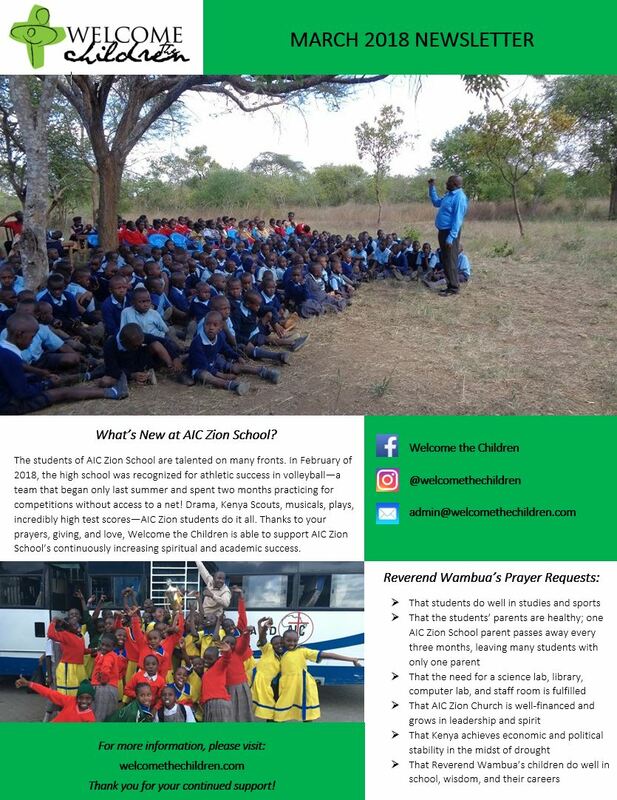 The cost to rebuild Building Block C, repair other buildings, replace classroom desks and textbooks, drill a borehole for permanent water supply, rebuild the compound fencing, and other repairs is estimated to be $40,000 USD. It has been very difficult for all working through the emotions of great loss due to this fire. 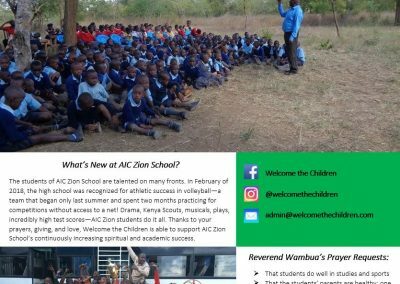 AIC Zion School is back in session and the teachers and students are managing with the space that is avaliable. Please continue reading for more detailed information and consider how you can be involed in the rebuilding process. 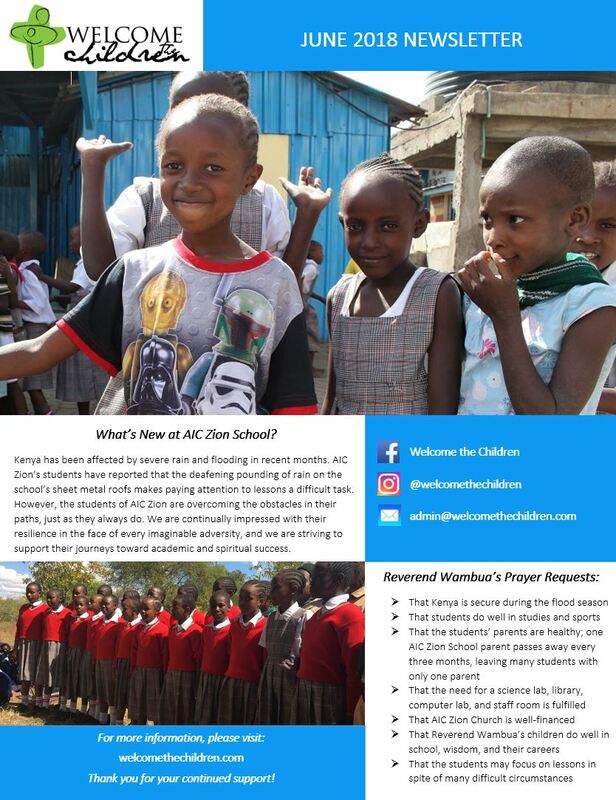 Donations can be made by going to the donate tab above and following the instructions to become a partner in our mission to care for Kenyan children in spirit, mind, and body.